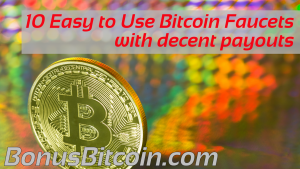 Home Bitcoin Faucets Ten Easy to use Bitcoin Faucets with decent payouts. There are hundreds, if not thousands of Bitcoin Faucets on the internet. And although the payouts are tiny – usually measured in Satoshi (100,000,000th of a BitCoin), the small amounts can add up over time. Faucet sites also vary in how much effort it is for you to claim your reward. Most, if not all require some sort of Captcha code or human verification, to prove your not an automated program. Some are quick and painless, whilst others are a real mission to get through. Let’s face it, you’re not going to get rich from Bitcoin faucets – but if you choose wisely – you can get the most Satoshi for the minimum time and effort. BonusBitcoin.co Not us! But our favourite faucet site. SatoshiOcean – it seems like this Faucet is not paying withdrawals any longer.